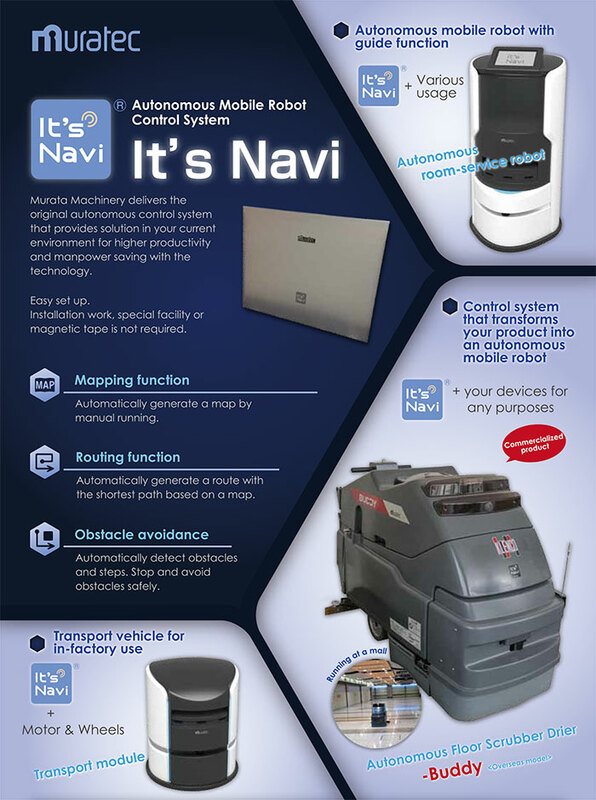 Autonomous Mobile Robot Control System "It's Navi®" | ADVANCED TECHNOLOGY | MURATEC, MURATA MACHINERY, LTD. Autonomous Mobile Robot Control System "It's Navi®"
An intelligent navigation system that fulfils all your transportation needs. “It's Navi®” (Intelligent Transfer Navigation System) is a control system that transforms any kind of moving platform into an autonomous unit. Independently developed by Muratec, It’s Navi® is a shared name for all Muratec products that incorporates this control system. The main feature of this product is its ability to remember and reproduce the path of travel, travelling speed, and travelling conditions after being manually driven on the desired path by an operator. By simply incorporating this system onto any existing moving platform, you can make it move autonomously from one place to another. The very first use of It’s Navi® involves a collaboration leading to the creation of the autonomous floor scrubber drier “Buddy”. Originally a commercial cleaning machine that one had to push from behind, It’s Navi® has transformed it into a robot that performs cleaning without manual input from an operator. It’s Navi® is able to memorize and perfectly replicate a planned route with the data of water usage, pad / brush pressure, traveling speed, and vacuum power. Buddy is your best friend and provides safe and efficient cleaning in a variety of places such as big shopping malls and public spaces. As an experienced provider of various Factory Automation (FA) solutions, Muratec not only conducts individual sales, but will strive to develop, design, and produce self-driving modules and autonomous robots incorporating our FA technology in accordance with requests from our customers.